The tragedy that was the RMS Titanic is being remembered in Winnipeg. Councillors Brian Mayes and Grant Nordman held a small ceremony to mark Winnipeg’s connection to the RMS Titanic Friday afternoon. 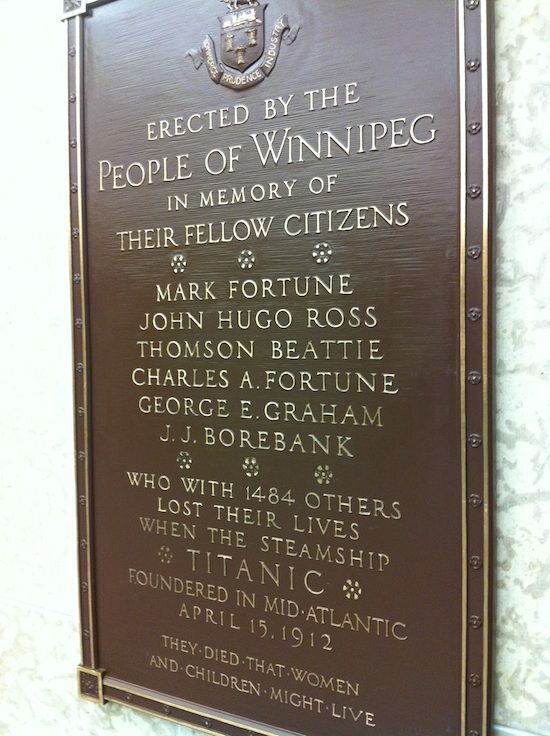 The two appeared before the Titanic plaque at City Hall — placed there in 1912.
Notable Winnipeggers were aboard the ill-fated ship when it went down, including Mark Fortune, who served on city council from 1879-1883. Fortune’s son Charles, John Hugo Ross, Thomson Beattie, George A. Graham and J. J. Borebank were also on board, and were identified as contributing to city development. Mayor Sam Katz invited the public to visit the plaque, located on the lower floor of the Council Building at 510 Main Street.